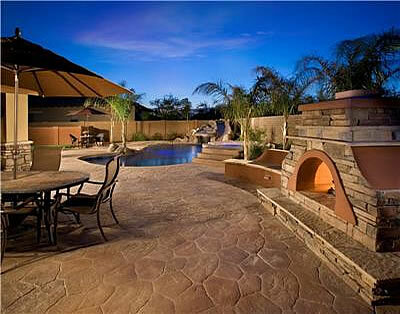 Part of your backyard patio experience is to create the ambiance and comfy atmosphere of an outdoor room. Equipped with all the amenities, such as a couch, fireplace, bar/grill, etc., you will find yourself spending hours outdoors, essentially creating your own backyard resort. The design tools you'll need to do this are all right here at your fingertips. Establish the basic floor plan and design scheme for your patio by installing stamped, stenciled or stained concrete surfaces. Add patterns and visual interest with sawcut patterns, texture, etc. Consider using concrete as your countertop surface for cooking areas and bar tops. Its durability and design versatility will complement your outdoor patio and last season after season. 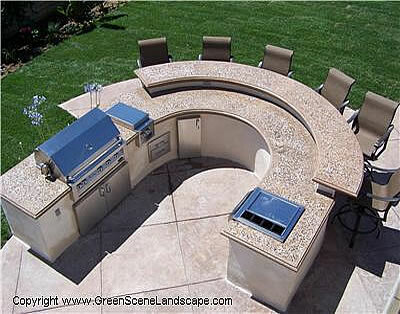 Read more about concrete countertops at ConcreteNetwork.com. Create a cozy conversation area with an outdoor fireplace. Get ideas for how to incorporate a fireplace with concrete. For both dining and lounging, outdoor furniture is essential for an outdoor room. However, many unique seating areas can be created using concrete. Concrete seat walls are excellent for adding seating areas. Some creative contractors have even created concrete couches or chaises that can be softened with pillows or cushions. It's surprisingly simple to add ambiance to an outdoor room with the sound of water. Whether it's a waterfall or pond, water can provide beauty, relaxation and tranquil sounds. Get ideas for concrete water features. Use these five design tips to create the atmosphere of an outdoor room on a concrete patio.